Sprinkler Fitters are pipe fitter specialists who have been trained in the installation of fire protection systems. The work includes the installation of underground supply piping, hydrants and fire pumps, which is connected to an integrated overhead piping system for suppression of fire. Installation of a system includes cutting and threading of pipe and assembling valves, pumps and other related equipment. To perform the job successfully the individual must be capable of handling material in excess of 100 pounds and working with tools off scaffolds, ladders and mobile platforms at heights sometimes in excess of 100 feet. May work in confined spaces and in trenches eight feet or more below ground level and many times in adverse weather conditions. 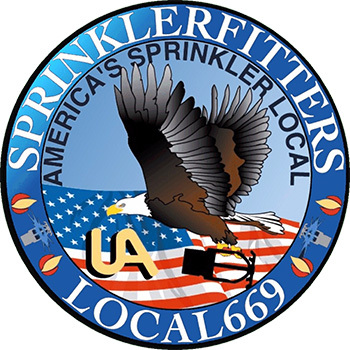 UA Local Union 669 Road Sprinkler Fitters, AFL-CIO, is dedicated to the education and training of its members. We strive to stay abreast of the continual evolution of fire sprinkler systems. Local Union 669 will furnish our contractors with journeymen and apprentices that have the aptitude, knowledge and skill to install a quality fire protection system. Our members work safely, proudly and reliably to assure our contractors and end-users that the fire protection system will operate correctly every time. As you take the time to read this recall of our past, you need to remember the early pioneers in our craft. At the time of our inception, the World was at War (WWI); Railroads were the chief means of transportation; and Arizona and New Mexico had just been declared states. The United States would go through the Great Depression, another World War (WWII), the Korean and the Viet Nam conflicts, and even put men on the moon, before Local 669 was to function as an autonomous local union. The tools and equipment used to install sprinkler systems in 1915 can be compared to the advances in the motion picture industry. In 1914, silent movies were the big craze, and look where that industry is at today. The very early days only show sprinkler systems being installed in large industrial projects, but today it is common to see systems being installed in residential occupancies. In 1915, the nonunion sprinkler fitter would draw one dollar per day in wages, but after the United Association worked out the agreement with the contractors association, the wages went to two dollars per day. The first agreement was a five year agreement and before the agreement was finally signed, the wage rate was fixed at four dollars per day with a built-in adjustment to four dollars and fifty cents per day for the last two years of the contract. The first agreement became effective July 1, 1915 and expired July 20,1920. We all share the deepest gratitude and appreciation for the sacrifices and perseverance of those who came before us. 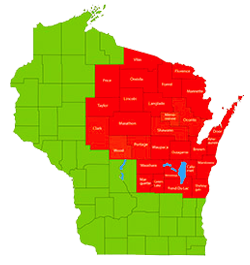 Due to Local 669 becoming an autonomous local union in 1972, the greater share of this historical data will serve as a tribute to those who have led and prepared Local 669 to move into the 21st Century. "Reflections of the past give new visions for the future" At best it is fair to refer to Road Sprinkler Fitters Local Union No. 669, U.A., as being almost 100 years young. On April 6, 1915, an agreement was signed by the United Association with the National Automatic Sprinkler Association, Inc., an employer group made up of the larger sprinkler manufacturing companies in the United States. It wasn't until 1972 that Local 669 functioned as an autonomous local union. Sprinkler Fitters were known as migratory workers, therefore in the United Association's Constitution, Section 88, the local union is called "Road Sprinkler Fitters Local 669." This was due to the fact that the men working for the large sprinkler companies had to travel state to state in order to maintain their employment, installing sprinkler equipment. Beginning in 1915, Road Sprinkler Fitters were taken into membership directly in the United Association. The Sprinkler Fitters actually held a general membership in the United Association. Local 669 was set up as a division of the United Association and was administered as such until the members of Local 669 elected its first full time officers and representatives in the summer of 1972. During these fifty-seven years of Local 669's History, several key events took place. 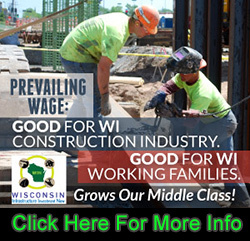 Several of the events were the direct result of law changes affecting organized labor.